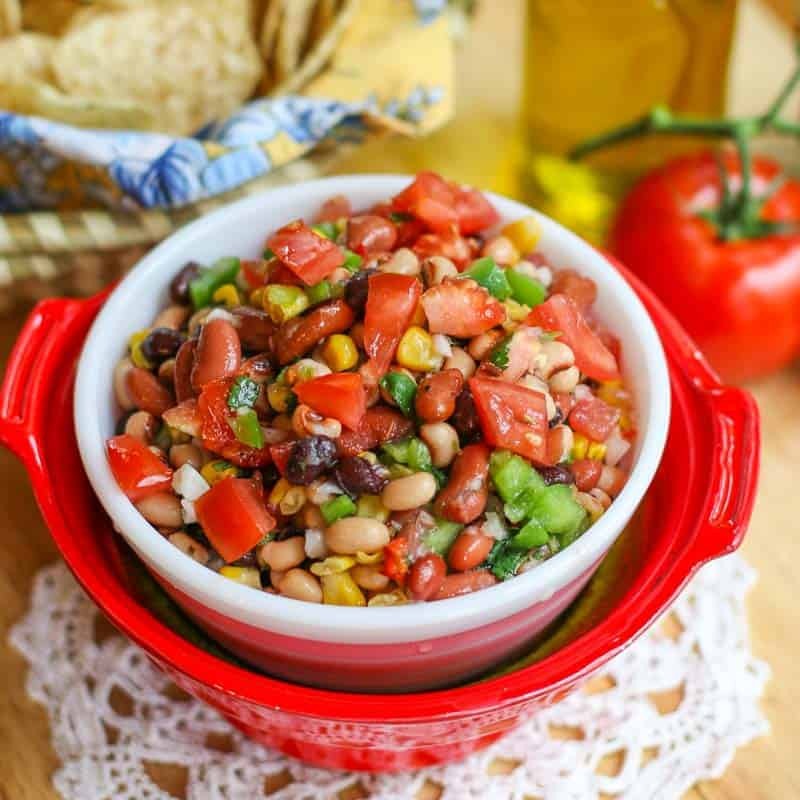 This Easy Texas Caviar Recipe is colorful, healthy, and full of flavor. Grab some chips or eat it straight out of the bowl. You are going to love this delicious salsa dip! This easy Texas Caviar recipe disappears quickly in my house. I make a huge batch and it is gone in like 24 hours. It is great on chips, but I also like to eat it like a salad. It is packed with so much healthy, wholesome goodness that I don’t have to feel bad munching on it. This Texas Caviar salsa is also a tricky way to get my daughter to eat her veggies… If I serve veggies as a dip with chips, she plows into it. If I just put it on her plate as a side dish, she would snub her nose at me. Ah… the joys of raising a teenager. Either way, she happily eats this stuff, so that makes me happy. I change this recipe up a bit by adding in kidney beans. They marinate well and are packed with nutrition. This is a sneaky way to make this dip even healthier and add a little extra flavor. 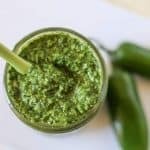 I also spice this recipe up a little more than the traditional recipe by adding extra jalapeños .. You know me, I add hot peppers to everything, like my Jalapeño Chimichurri Sauce . But if you can’t take the heat, just add in one jalapeño and omit the rest of peppers. You need at least one to give it a little kick. This recipe is great for parties and entertaining. It makes a big batch at one time with relatively little effort. The freshness and color makes people go crazy over this. I have a homemade tortilla chip recipe that will really make this dip special. They are crazy crunchy and so much better than store bought. I suggest you make both! 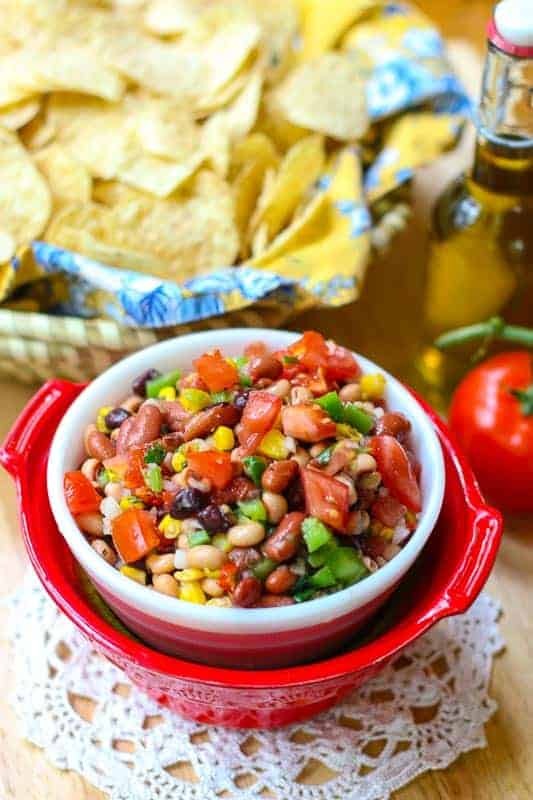 Therefore, the next time you are trying to think of a good appetizer for your next backyard cookout, remember this spicy Texas Caviar recipe version! Enjoy! Store in refrigerator at least an hour, but for best results, store for 24 hours for flavors to build. 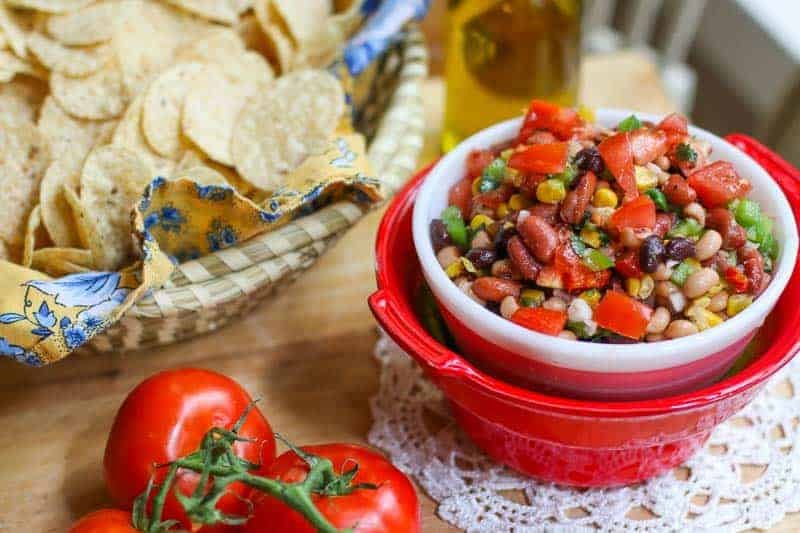 Yum Texas Caviar is such a great summer appetizer! I love that your recipe has plenty of jalapenos for a nice spicy kick! My favorite! I could totally eat it with a spoon! It doesn’t last long around my either! So good! I have to make some! Thanks for the inspiration! I love that this is called Texas caviar! It’s not something that is known here in Italy but it looks and sounds delicious. Great as a bbq side too! What a fantastic recipe for feeding a crowd (or just the family)! It looks so bright and beautiful ….and full of healthy ingredients too. Oh yess, this texaas caviar is full of goodness and flavors, it wouldn’t even last 24 hours in my home, can’t wait to try it!